"Nobody could have expected I'd win here. 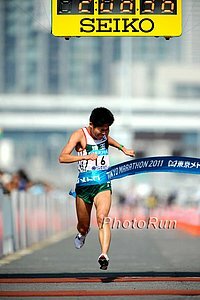 I felt good, everything went well and the oldest man in the race won." - American Khadevis Robinson on his stunning 800m win yesterday in Rome, where he passed the entire field the last 250m, including the last 2 World Champions and 3 sub-1:43 runners. Sammy Wanjiru's Mom And Wife To Have Representatives At Today's Autopsy Hopefully after the autopsy, he can get the proper burial he deserves. 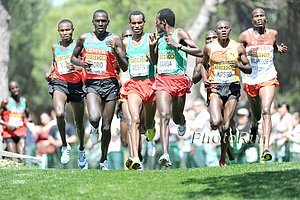 *Oregon Coach Vin Lananna Says He Hates Regional Meets And Sees Them As An "Unnecessary Hurdle"
LRC Week That Was: Sammy's Shoes, Winners And Losers At Occidental - And, Yes, Ultra Running In our weekly look at the running world, we have some interesting tidbits on Sammy Wanjiru's shoes, we look at the action from the Occidental High Performance Meet, we have a simple tip to improve the sport, and we even talk about running for 48 hours straight. Thursday Brazil's World Indoor Pole Vault Champ Fabiana Murer Highlights IAAF World Challenge Meet In Rio de Janeiro UK's Dwain Chambers will be racing here, as he is not allowed to race in Rome due to previous 2-year drug ban. October Race A 5k Where You're Being Chased By Zombies? Interview With Australia's Ben St. Lawrence He talks about making the transition from a full time job to just running, his recent race performances, his future plans, and mentions how US training partner Bobby Curtis is "pretty handy in the kitchen." 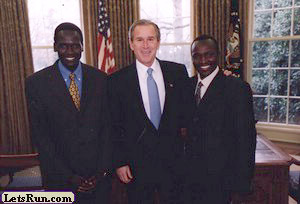 Recommended Read: Sammy Wanjiru's Dangerous Idea: What If We Ran The Marathon With No Fear? 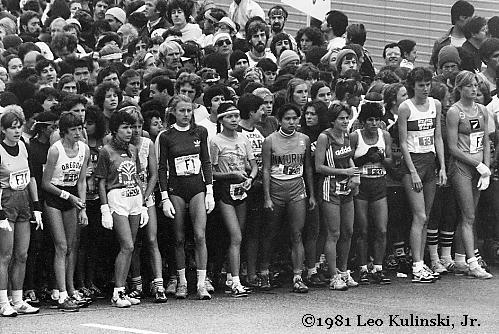 "Throughout the last century, the marathon was the one distance that demanded conservatism ... marathon runners don't go out too hard in marathons, because they fear what will happen in the final miles if they do. This fear is rational. It's sane. It's healthy. And it was shared by everyone and corroborated by years of collective experience. 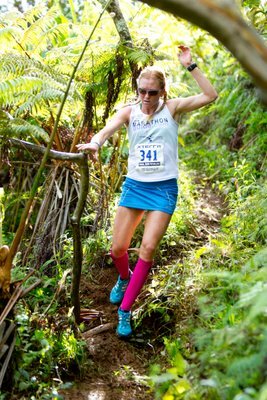 You don't have to be told to fear the marathon, you just do." Sammy Wanjiru didn't share this fear. Doug Logan Reaches Settlement With USATF On His Termination Eight months ago, Doug Logan, the USATF CEO, was canned by the Board of Directors and USATF argued he was fired with cause and they did not owe him his $1.6 million in severance. USATF reportedly had offered him a $500,000 severance before he sued. In their counterclaims, USATF argued he abused expense reports and called the Board a bunch of clowns. Meanwhile, 8 months later, USATF still doesn't have a new CEO, but things are running smoothly. Maybe the interim head should stay. New York City Marathon Wins Sports Business Journal Sports Event Of The Year Award Congrats to the NYRR. Latest News: Wanjiru's Lover Says He Didn't Commit Suicide, Says He Planned To Marry Her That would have made her his 4th wife. Judge's Ruling Postpones Sammy Wanjiru's Funeral 14 Days Sammy Wanjiru's tragic death has turned into a soap opera of sorts. Charges of murder against his legal wife by his mother, two other women coming forward claiming to be his wives, and two men coming forward claiming to be his dad (one a stepdad and one a biological dad he never met.). On Thursday, a judge postponed the funeral while the investigation continues and it was revealed the video cameras at Sammy's house don't show his fall. Nice Read: Professor Of The Marathon Sean Hartnett Remembers Sammy Wanjiru This article had the quote of the day earlier Friday. 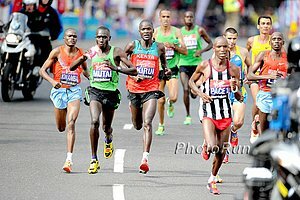 How Did Sammy Wanjiru Beat The Heat At The 2008 Olympics??? Study shows that heat doesn't actually slow us down, our mind does first. "We don't slow down because we're dangerously hot; we slow down to avoid getting dangerously hot." 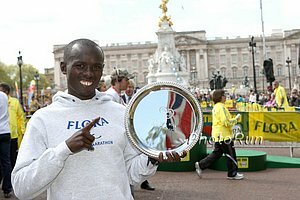 For many people, it's a sell-fulfilling prophecy, but "maybe someone like Sammy Wanjiru simply wasn't burdened by the belief that heat would slow him down ..."
Simon Turnbull: Wanjiru: The marathon man who ran fast and lived even faster The writer points out that Wanjiru and Prefontaine aren't the only greats to die early. Belgium's Ivo Van Damme, silver medallist in the 800 and 1,500 at the 1976 Games, died at age 22. 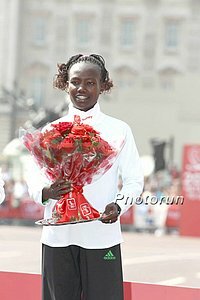 Steven Downes: "So great was Wanjiru's talent, he was compared to figures from classical mythology." 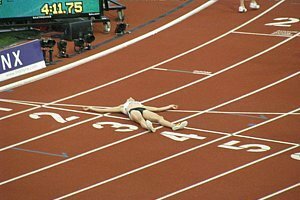 British 800m Star Jenny Meadows Sleeping In Altitude Tent Apart From Her Husband Until 2012 Olympics Her husband hopefully can find some solace in this thread. 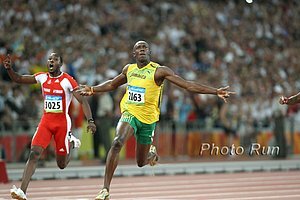 LRC: Usain Bolt Nips Powell, Khadevis Robinson Storms From Last To First To Shock The World (More coming) 47,000 fans and a worldwide television audience were focused on the Usain Bolt-Asafa Powell showdown and it did not disappoint, as Usain Bolt - who said he was nervous for the first time ever - overtook Asafa Powell in the final meters. 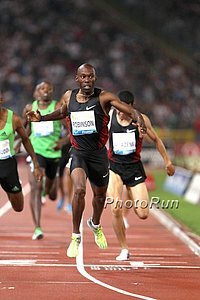 The surprise of the evening was the men's 800m, where 8 time US champion, 34-year-old Khadevis Robinson put on a stunning display the final 250m, going from last to first to win (video here). Last year, KD was rabbiting Golden League races, now he's winning them. In other action, Allyson Felix went sub-50 to defeat Sanya Richards-Ross in the 400 and world XC Champ Imane Merga showed his great finish in the 5,000m, running 12:54 and throwing down the gauntlet to Bernard Lagat, whom he'll race in 25 weeks in NYC. Sara Hall had a 9 second pr to get a Worlds and Olympic qualifier in the steeple and Christin Wurth Thomas led the women's 1500 at the bell before finishing 6th in a qualifying 4:03.72. 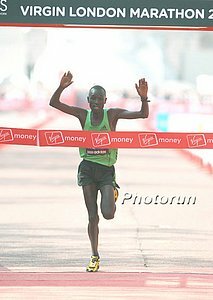 Mo Farah And Paula Radcliffe Racing Bupa London 10,000m This Monday Paula is returning after 18 months away from racing and will face off against countrywoman Jo Pavey, who recently ran marathon debut in London (2:28:24). Jeremy Wariner And Allyson Felix Vs. Sanya Richards-Ross Headline 400m Fields At Prefontaine Classic Oscar "Blade Runner" Pistorius is in 400, too. Nick Arciniaga Blogs: US Marathon Team's Hopes At World Champs & How He Puts Priority On His Dreams Over Money "The one thing that I concerned myself with was the Olympics, and to this day that has not changed. I am going to live out my dreams first, and if that doesn't make me any money, then I'll find some job to pay the bills and continue living the only way I want to live; as a runner." 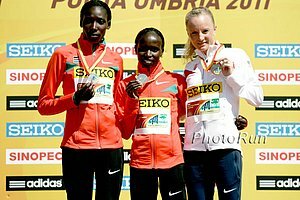 Stephanie Hightower For USATF CEO? USATF President Stephanie Hightower Could Become USATF CEO Search committee chair Steve Miller acknowledged to the preeminent Olympic writer in the US, Philip Hersh, that USATF president Stephanie Hightower could become the CEO of USATF. The move would be highly controversial, considering the USOC has said it would not be a good idea to make a board member CEO, not to mention the fact that many of you all do not have a positive perception of Hightower. The search committee has kept the candidates names confidential until now, so the leak of the Hightower candidacy seems deliberately done to test the public reaction. It seems obvious to us that if Hightower wants to be considered for the job, she should resign as USATF President immediately. *Vin Lananna Admits He Met With The USATF About Its CEO Job Apparently he was their first choice, but turned it down. There is talk, though, that they may leave the position open until after the 2012 Trials when Lananna would be more available. A Must Watch John McDonnell Uncut: 17 Minutes Of Video With The Greatest NCAA Track/XC Coach In History This video interview is very well done and covers McDonnell's whole career from the highlight (first NCAA title) to lowlight (losing NCAAs after winning 14 years in a row), but what comes across is what a class act Johnny Mac was and still is. The secret? Hard work. "When I was coaching, I was the drillmaster to myself. I left the house - never later than 6:30 in the morning - and never got home before 6:30 and that went on all year long except for two months in the summer. I'm definitely not an ego-type person. I always like to stand back and let the athlete get the glory. 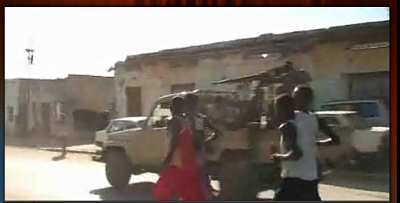 They are the guys out there hurting and doing the job. It helped me as coach to (not have an ego). Egos are good if they are controlled. Meet UConn Coach Greg Roy - A High School Coach At Heart Roy is terribly underrated, as UConn is a Big East power seemingly every year. "As a high school coach, you kind of take what you've got and you make a team out of it. You don't have the luxury of going out and recruiting the best distance guy or the best thrower. You've got to be a teacher and you've got to field a full team. That's been my approach ever since." Five 800 Runners Get "A" Standard As Men's 1,500 Runners Don't Go With Rabbits The men's 1,500 was supposed to be the highlight, but the 800 runners stole the show, as Cory Primm (1:44.71) and Tyler Mulder (1:44.83) picked up the A standard in the men's 800, with Jeff Riseley (1:45.02) dominating the "third" section with an A qualifier of his own, and Khadevis Robinson (1:46.01) taking the "second" heat. In the women's 800, Alice Schmidt (1:59.48) and Maggie Vessey (1:59.56) got Worlds qualifiers as well. In the men's 1,500, 7 guys ran 3:37.20 or better but none got the A standard. In the end, Andrew Wheating outkicked a bunch of guys to win in 3:36.46 in a race where Canada's Taylor Milne was the only one who ran with a pair and tried to go with the perfect pace that was being effortlessly set by Olympic silver medallist Nick Willis, who went through 1,200 in 2:53. Sub-13 man Matt Tegenkamp finished dead last in 3:40. *Nick Willis Is Rightly Not Worried About Not Having Worlds Time Hardly anyone has the time and the Olympic silver medallist is starting his first season after an injury-free buildup for the first time in 3 years. He rabbitted the 1,500 on Saturday and looked effortless in going through 1,200 in 2:53. 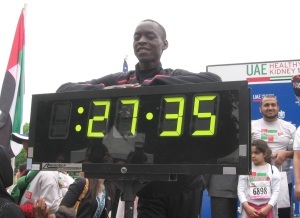 Edward Cheserek Completes 1:52/4:10/8:53 Triple Is he better than Lukas V? Illinois' Kayla Beattie Runs # 5 All-Time 3,200 Of 9:56.96 She also did 4:43.65 for the 1,600. Profile Of Lukas V We have to disagree with his coach, who calls him the greatest US HS distance runner in history. On accomplishments alone, we'd say others achieved more, and then we're not sure if he's even a US citizen - and he certainly wasn't for all of HS. John Perry, Former MD Decathlete And Roommate Of Olympian Mark Coogan, Is On Hunger Strike In NYC And Vows To Continue Until Death Perry vows the hunger strike will go on unless the New Yorker retracts a story it wrote about him last year.